One of the most unique and highly photographed buildings in the Phoenix area is Copenhaver Castle. Located at 5050 E. Red Rock Road, Phoenix, Arizona, the private residence is on the south side of Camelback Mountain near the neck of the camel. The castle home is a prime example of medieval architecture, featuring large, rose-hued cut stone crenellated walls, round towers, and arched windows. It was modeled after an old Moorish fortress in Spain that the designer and builder had remembered seeing in a movie when he was a child. The castle was built over a twelve-year period by Phoenix orthodontist, Dr. Mort Copenhaver, during the 1970’s. The plaque near the driveway entrance reads “1967” when the five acre, almost vertical property was purchased. The exterior walls of the home were built of stone blasted from the mountainside property, which makes the home blend into the mountain’s terrain, thus making it aesthetically pleasing seen close-up, or at a distance. Dr. Copenhaver donated money to missions in Mexico, and some of the Hispanic missionaries helped with the home building, along with dental patients, who bartered construction projects for his dental services. The castle was featured on Bob Villa’s show, “This Old House”, in 1986, and is frequently shown on The Learning Channel as a much requested re-run because of its uniqueness. It was opened for tours, but after the home was sold in 1989, it is strictly a private residence. The interior of the 7000 square foot home was built using eight levels, with ten balconies providing a great view of the valley. It has twenty rooms, including five bedrooms, seven and one half bathrooms, four fireplaces, and three garages and carports. The living room has a seventeen foot waterfall that cascades above the fireplace. The Great room features a spa that seats twenty people. Above it is a retractable roof for views of the famous Arizona blue sky, or a wonderful view of the stars. It also has a billiard room. A dungeon, is accessed through one of the many secret passageways in the home, and it includes a wet bar. A helicopter pad is located on the roof for easier travel to the airport. There is a drawbridge, and a moat, as well, because after all, it was designed to be similar to a Moorish fortress. At the driveway entrance to the castle, are a large wrought iron lamppost and a smaller light fixture with black gargoyles on them, which seem to be guarding the property. There is also a coat of arms plaque with the original name sandblasted or eroded off, which is located near the year plaque. The driveway is a one-lane very steep pathway leading up to the gated and stone fenced property. During the mid- 1980’s, Dr. Copenhaver put the castle on the market in 1985 for a $7 million dollar asking price. In 1987, the price was reduced to $2.5 million dollars. Dr. Copenhaver lost the home in bankruptcy proceedings after it was used for collateral for loans in his business dealings. Chase Bank of Arizona owned it until it was sold in 1989 to Jerry Mitchell, a self-made millionaire rancher and Texas native, who often played polo with Dr. Copenhaver, and had attended the dentist’s lavish parties at the castle. He never thought that he would eventually be buying the castle, a steal at $985,000 dollars, but worth so much more. It is said that just the installation of the driveway alone was about a half-million dollars in labor and materials because of the steep slope of the property. Instead of using medieval interior décor in his home like Mort Copenhaver did, Jerry Mitchell opted for a Western-styled cowboy theme with his favorite color, red, incorporated into the color scheme. 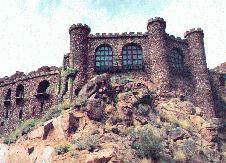 He used lots of Native American rugs and cowboy artwork, renaming the castle as his “Camelback Castle”. He owns Krazy Horse Ranch, a tourist attraction in Branson, Missouri, and also owns a ranch by the same name in Black Canyon City. He juggles his time between locations, along with other special interests, both business and personal. . It would be wonderful if Jerry Mitchell would open his home for a special tour. Perhaps he will some day, but until then one can only dream of what it looks like inside the castle’s walls and courtyard area. The history of the architectural building known as the castle dates back to 8th Century Europe. In its earliest and simplest form, the first castles were strongly built in key locations to withstand enemy attacks. The first castles were built out of wood, but were quickly changed to a stone exterior when enemies burned down or battered through the wooden ones. Castles were generally built on top of a natural hill so that with the height of the building and the towers, the knights would have a better vantage point from which to see the enemy. Copenhaver Castle is a wonderful local example of Moorish castle architecture. The massive stone walls and solid construction of the building is a guarantee of its ability to still be standing on Camelback Mountain centuries from now. The exterior architecture of the castle, including the battlements, (or crenellations), which is defined as the gaps at regular intervals to allow the knights to shoot at the enemy, are interesting details. The rounded towers at the corners of the east walls of the castle are similar to Moorish Castles. So are the arched, wooden framed windows which are located on the upper levels, while the smaller windows primarily used for light are on the lower levels. Viewing the exterior of Copenhaver Castle wets the appetite to the many splendid castles that await exploration in countries all over the world. Now, the old saying, “A man’s home is his castle” can be better appreciated and understood, because of the major functions of a home: shelter and security. According to the Phoenix City Visitor’s Bureau, Copenhaver Castle is one landmark that will continue to be a favorite to Phoenicians and visitors alike. I was just looking through realtor.com the other day and come across this castle in arizona for sale and thought it looked really familiar, since I am always visiting your website. So I checked in reference and found out that it is the copenhaver castle in phoenix, arizona. The asking price is 7,995,000 and the mls# is 1803044 in case you want to check it out. FYI, the Copenhaver Castle MLS ID# has changed to 2224731 and the current listing price is $10 million. Drop in the bucket! I am close friends of Jerry Mitchell and just to let the interested people out there know the inside of the castle is beautiful. He does have it decorated in western style. The inside is still beautiful and im trying to talk Jerry into re-opening the castle for tours. If I get anywhere on that I will let you know. And yes he is selling the castle but it has been up for sale for a couple of years now and they are thinking of taking it off the market but I dont know what they are doing. I have this information as a result of an impromptu self-guided tour of the Castle! My son and I were driving on Camelback mountain yesterday (12/15/2008) and we saw the ReMax sign - so we decided to brave the steep drive and see if there was a flyer or an agent! It appears that there had been a handi-man/remodeler onsite and perhaps he was gone-to-lunch or to the hardware store. The Castle was open and there were flyers on a countertop. We were able to see it all as described here on your web-page including the lovely dungeon-with-wet-bar! It is currenlty unoccupied. It is empty and immaculate! There is no Red Cowboy Decor? Only very Spanish-looking carved wood and some 1970-esque mirrors? The mirrors seemed more fairy-tale castle-ish than anything else. There seems to be some modest updating occurring. The Castle itself is stunning and immaculate, as I stated! It was a thrill to see it and I feel strongly that it should be available for tour or at the very least private parties. In fact, I forwarded the listing to an interested party. The information on this page was from a report written by Lynn P. of Phoenix, AZ.